Happy Friday everyone! I hope everyone is having a great day and that everyone's weekend is just as wonderful. I wanted to share an invitation I created a little while ago for the lovely Lauren. She and her husband to be Kyle are getting married this month and are having a small intimate reception to celebrate. To let friends and family know of their plans, she asked me to create an invitation inspired by the old tradition of guests receiving a hand written note from the bride (or bride's family) inviting guests to the celebration. Because Lauren is using white hydrangeas as her main flower, she chose my hydrangea design and I painted them with the light green and yellow washes that are commonly found on "white" hydrangeas. Inside the note card, each guest was greeted with a note hand written especially for them. I had a great time making these for Lauren, and wish the two of them the best! I hope your wedding and marriage is everything you both hope it will be. 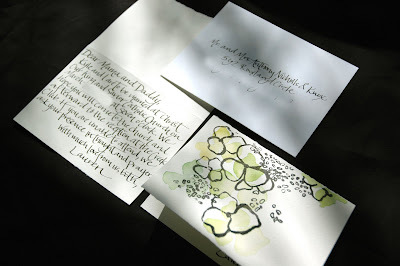 And can I just say one more time how much I love that the hand written tradition is coming back to the wedding scene? It's just so personal and special!